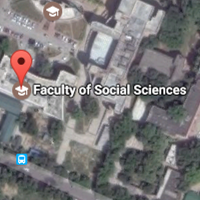 The Faculty of Social Sciences, was established under the provisions of Statutes 9(1 of the University. It is one of the nine Faculties established prior to the Delhi University (Amendment Act 1952) and is one of the oldest academic centres of the University. Prior to 1989 it was known as Faculty of Arts and Social Sciences. The Faculty of Social Sciences comprises of nine Departments offering fulltime Ph.D.,M Phil. and Post-graduate Programme in nine disciplines. These are, Adult Continuing Education & Extension, African Studies, East Asian Studies, Economics, Geography, History, Political, Sciences, Social Work and Sociology. Some Short Term Courses are also offered by the Department of Adult Continuing Education & Extension, Department of African Studies and Department of East Asian Studies. The position of Dean who heads the Faculty of Social Sciences is rotational like other Faculties from amongst the Heads of the Department under the Faculty. The seniority of the Department is calculated based on the date of its establishment. It has the power to deliberate on any academic matter and make recommendations to the Academic Council for taking decisions. Membership of the Faculty is defined by the Statues 9(3) of the Delhi University. Faculty of Social Sciences Building, University of Delhi, Delhi 110007.